This is an outstanding 3? x 4? deciduous shrub with graceful arching stems. Small pale pink flowers are borne in clusters along the leaf axils in summer followed in the fall by clusters of spectacular rich lavender berries. 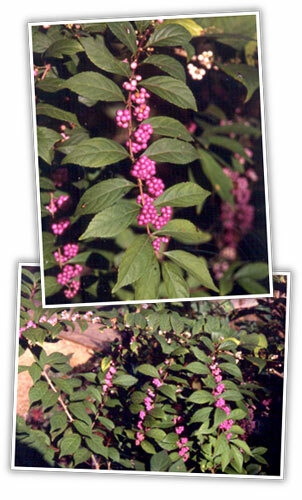 This is a more delicate form of our native beautyberry with smaller leaves and a smaller growth habit. Full sun to dappled shade.